Dr.'s Smith and Marlowe have several years of advanced training and experience in pediatric dentistry, and are experts in meeting the physical and emotional needs of children. They are gifted at putting children at ease, and seeing each one as unique and special. This combination of training and experience allow Drs Smith and Marlowe to make children (and parents) feel happy and excited about coming to the dentist, while skillfully meeting each child’s dental needs. The following are what make these two individuals top rated pediatric dentists in Idaho Falls. Dr. Smith has been a Pediatric Dentist in Idaho Falls since 1997 and opened Alligator Pediatric Dentistry in 2000. Prior to returning home to SE Idaho he completed his Pediatric Dental Residency at Primary Children’s Medical Center in Salt Lake City, Utah in 1997. He received his DDS from the University of Washington School of Dentistry in 1995. He attended Brigham Young University in Provo, Utah and in 1991 received his Bachelor of Science degree in biology. In 1988, Dr. Smith obtained his Associates Degree in Arts and Sciences from Ricks College in Rexburg, Idaho. Dr. Smith grew up in Rexburg, Idaho and enjoys living in Idaho Falls, Idaho with his wife, Melani and their amazing family: Lindsey (and her husband Sam), Jacqueline, Mitchell, and Brooklyn. They enjoy spending time together boating, waterskiing, snow skiing, riding motorcycles and spending time in the outdoors! Dr. Smith is a fun, energetic and compassionate person and loves what he does. He was presented the Outstanding Professional Award by the Idaho Parents Unlimited, Inc. He first became interested in Dentistry after his little brother Cameron was injured in a bicycle accident. It was at a very young age he developed an interest in dentistry, especially pediatric dental medicine. A kid at heart, Dr. Smith knows the work he and his team do is important and even critical at times, but they always have fun while they are at it. It is no secret why he is a top pediatric dentist Idaho Falls residents love! Dr. Mark Marlowe is an Idaho Falls native who came home to do what he loves – work with children. 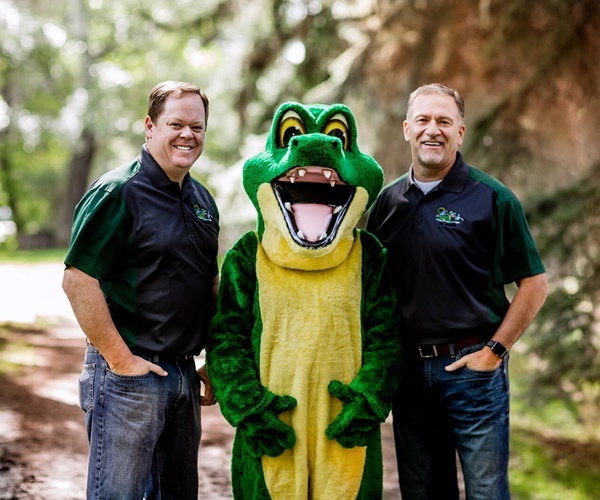 Prior to joining Alligator Pediatric Dentistry, Dr. Marlowe completed a two year Pediatric Dental Residency at Miami Children’s Hospital in Miami, Florida in 2009. In 2005, he earned his DDS from Virginia Commonwealth University School of Dentistry in Richmond, Virginia. Upon completion, Dr Marlowe returned to Pocatello where he completed an additional year of training at the Idaho Advanced General Dentistry Residency at Idaho State University. Dr Marlowe is a Board Certified Pediatric Dentist and is a diplomate of the American Board of Pediatric Dentistry. He is affiliated with the American Dental Association, as well as the Upper Snake River Valley Dental Society. Dr Marlowe grew up in a large family where he first practiced the skill of working with children and adolescents. After completing high school, he attended Idaho State University where he received a degree in biology, while competing on the men’s tennis team for four years. Dr. Marlowe married Michelle Kunz from St. Anthony, Idaho in 1996. They are the grateful parents of six children who keep them very busy and active. The Marlowe’s love sports, history, and the great outdoors. They have enjoyed being back in southeast Idaho among family and friends. Dr Marlowe, like Dr Smith, is a big kid at heart and the bond of trust and kindness he establishes with his patients is a big part of why children look forward to coming to the best pediatric dentist Idaho Falls has to offer!